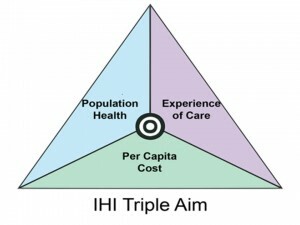 Still, I do believe that the Triple Aim has played a key role in shifting the health reform conversation in important directions — population health, patient centeredness, and lowering costs. That we can see so many examples where our medical system is moving backwards on these goals is , in my view, not an indictment — it’s a recognition that this is never easy and it’s never over. We all have an obligation to speak out more forcefully against those who take advantage of reform for their own self-interested purposes. It’s also worth asking, what existed as the overarching goal for health system reformers prior to the Triple Aim? To my recollection, not much at all. That has been Berwick’s genius for many years now — to fill the vacuum at the right moment with the best message that captures the essential challenges and opportunities of the time. As I travel outside the U.S., I am astonished by how often I hear health system leaders in other nations mention the Triple Aim — even countries where rates of health spending are far below ours (meaning everywhere!). The 2008 creation of the Triple Aim was not a victory speech, but a call to arms. The signing of the ACA in 2010 was not its victory lap, but the widening of its purpose, opportunity and potential. Bully for Paul Levy for pointing our the weaknesses and inadequacies and distortions. Bully to IHI and the Triple Aim innovators for keeping on keeping on.